Ok, so having thought, read and talked about IoT for a few years now in a professional context, now I REALLY want to work out some personal Internet of Things ideas and experiments myself. So let’s get it started! Basically I need 4 ingredients, (1) An internet connection (2) A laptop with programming environment (3) A microcontroller and (4) A Thing to connect to the internet. Well the first two ingredients are simple, I have a fast Ziggo internet connection and as for the laptop, I use my office laptop (that is not a fancy Mac but a 2kg rock solid Dell Latitude E5500, I call it “the monster” geh geh). It has Visual Studio 2012 Express Edition (free) on it. Maybe I will upgrade to professional some day but for the time being Express works just fine. The third ingredient I need is of course a THING to connect to the internet. I’m going to build that myself (I’m a maker after all eh ;-). Time to dust off all that good old Technic Lego which I haven’t touched for about 25 years. I really want to use that old 9V Lego motor as an acutator for something. By the way, evertything you always wanted to know about Lego motors you find here (although… the model I have is not listed, maybe I have a collectors item here). It has a different voltage as the Netduino (5V), so I will have to see how it will run. I went to my parents recently to get the Lego. All the Lego parts were still in that big unorganized box I used to dig in to find the parts I needed. These days I’m a bit more structured so first thing I did was to sort the parts nicely… but when finished I thought where is my Lego motor?! I figured it might be with my brother, and indeed he found it somewhere in his house. 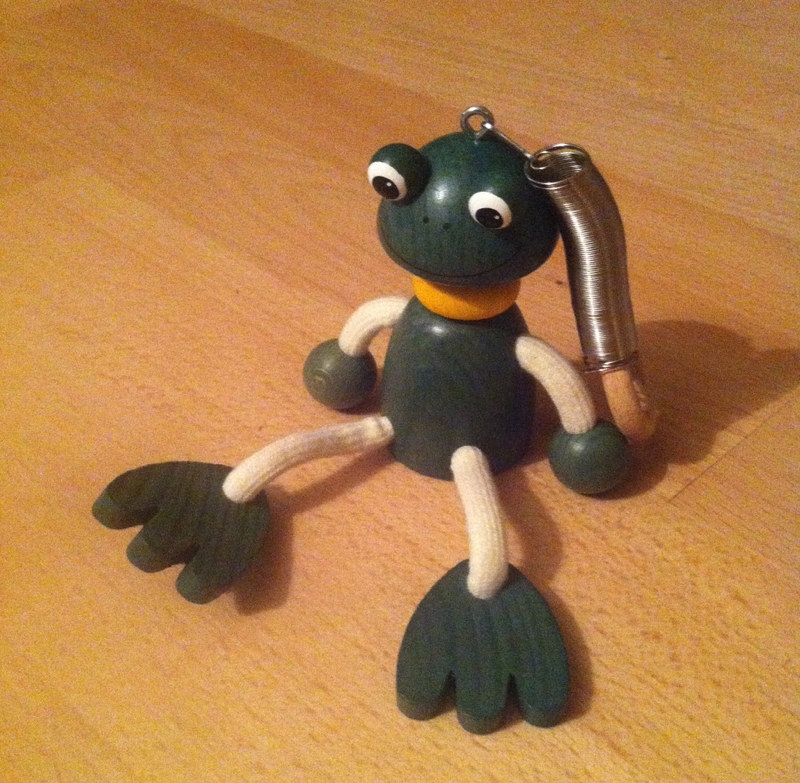 This summer holiday I bought this happy thing in Budapest Hungary this summer.It has a spring and when you move it up and down, the froggy bounces happily. Let’s make this an Internet of Things thingy! What I want to do is to take the Lego motor and build some mechanism with imitates my up-and-down hand motion. For this I want to implement one of the mechanical engineering tricks from this brilliant movie Mechanical Principles (1930) by Ralph Steiner. My ultimate goal here is to make the thing Twitter-controlled. The idea is that when I send a tweet to e.g. @GreenFroggy, the motor will run for a few seconds and the frog starts to bounce up and down. Additionally I could add a light tickertape thingy or a seven segment display so that I can see who’s tweeting, that would be AWEsome wouldn’t it ;-). 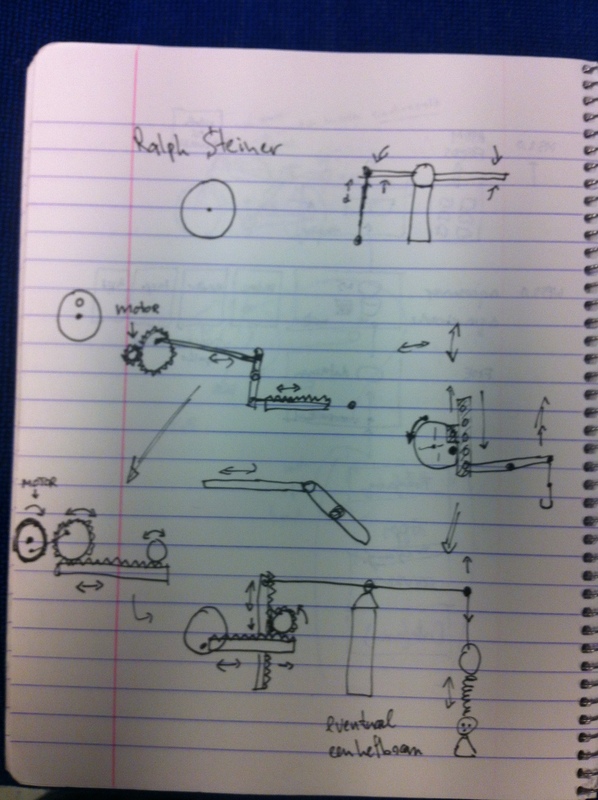 Below some rough ideas for the mechanism. Ok, I have the ingredients, I have a design… Now it’s time to start building and programming (next blog).